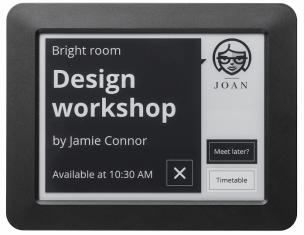 AMSYS Innovative Solutions, LLC, announced today that Visionect, the leading European developer of energy efficient signage has partnered with AMSYS as their primary North American Distributor for Joan Meeting Room Assistant. AMSYS nationwide presence, the convenience for customers and the option of offering great customer service in the North American territory were key in selecting AMSYS, as was the company’s central location, in Texas. The new partnership comes just as Joan, the eco-designed digital door label and meeting room scheduling solution, has won a CES 2016 Innovation Award for its sustainability and energy efficiency (http://www.businesswire.com/news/home/20151110006911/en/Ink-Named-CES-2016-Innovation-Award-Honoree). Joan consumes 99% less energy than other room booking solutions, connecting via Wi-Fi with the calendars you are already using – Google Apps, MS Office 365, and MS Exchange 2010 or above. Joan will be officially launched at January’s CES 2016 (https://www.cesweb.org/), taking place in Las Vegas, Nevada. Preorders (https://joanassistant.com/products/joan-meeting-room-assi...) are opened now, with the final product to be shipped in the first quarter of 2016. AMSYS Innovative Solutions is in the business of “applying intelligence” (helping companies through better use of technology create efficiency, manage risk, reduce cost, and grow revenueEMRG), with business solutions exceptionally executed for organizations in the Enterprise, SMB, and Federal, State & local government and education markets.